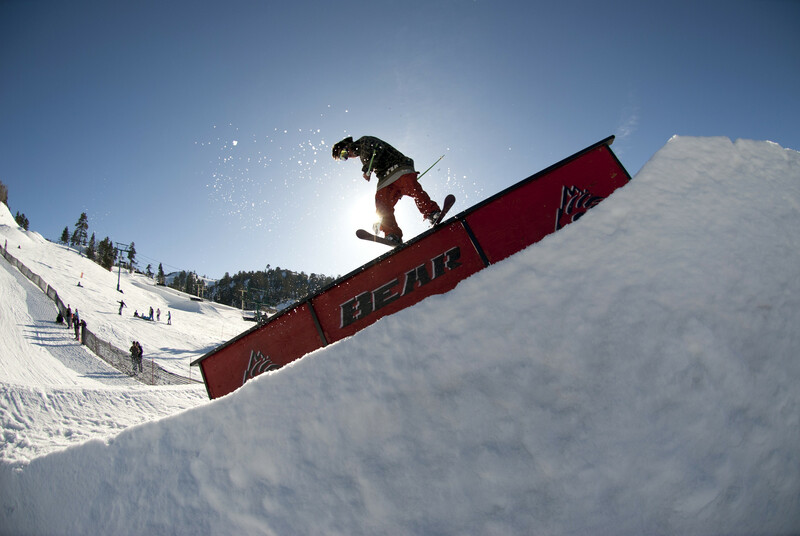 Located in Southern California’s San Bernardino Mountains, Bear Mountain offers a 200-acre winter playground to skiers and snowboarders. 85% of Bear Mountain is covered by over 100 freestyle features; the mountain features over 165 beginner to advanced rails, boxes, walls and other features, 4 pipes that include Southern California’s only Superpipe, along with Bear Mountain’s Skill Builder Parks geared toward freestyle skiers with beginner skills. Bear Mountain’s Beach Bar serves up great drinks in the base area while their Ice Box shop has the latest in gear for skiing and snowboarding. Restaurants located throughout the resort along with various stops to snack, coffee bars, repair shop, sports shop and lessons. One hundred percent snowmaking. Big sundeck.